Sport Court suspended surfaces are the Safest Courts in the World™, featuring the latest technology in tennis court surfaces. 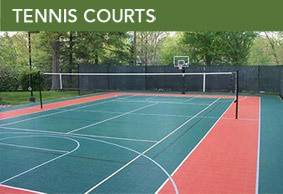 Sport Court West engineers their tennis court surfaces to provide the highest level of shock absorption and Lateral Forgiveness to reduce the stress on your joints and back typically associated with hard tennis court surfaces. 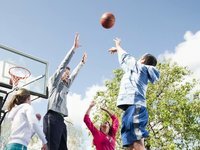 Sport Court® conducted extensive testing with The Orthopedic Specialty Hospital (TOSH*) to determine the effect of different playing surfaces on the body. Shock! There was significantly less shock on the body when landing from jumps on PowerGame surfaces vs a concrete like platform. Stress! There was less stress on the knee joints. Stability! PowerGame was as stable as a PowerGame was as stable as a concrete like platform with all of the safety benefits of shock absorption. *TOSH – The Orthopedic Specialty Hospital is one of the country’s premier facilities for orthopedic care and sports medicine. 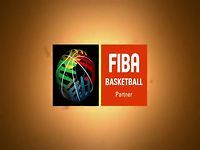 PowerGame is The Safest Court in the World and features the lowest skin abrasion of any outdoor court surface and is made of the highest quality materials and UV stabilizers to protect your investment. The patented Double-Tier shock absorbing grid and Lateral Forgiveness™ reduce joint strain and fatigue and allows you to play tennis longer with less risk of injury. 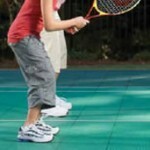 PowerGame is the official suspended modular surface of the United States Tennis Association. 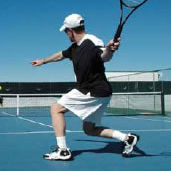 SportGame™ is the advanced athletic suspended surface for multi-sport play including tennis. The patented design provides excellent traction and low abrasion for safe play at an affordable price. The Lateral Forgiveness™ helps to reduce joint stress and fatigue and allows you to play tennis longer with less risk of injury, without sacrificing ball bounce and response. SportDeck™ is the ideal suspended surface for racquet sport players of all abilities, SportDeck™ retrofits over most hard court surfaces and outlasts conventional acrylic courts. SportDeck has been the steadfast outdoor surfaces for nearly two decades and provides excellent ball control and pace of play while reducing joint stress and fatigue with patented Lateral Forgiveness™ that allows you to play tennis longer with less risk of injury.